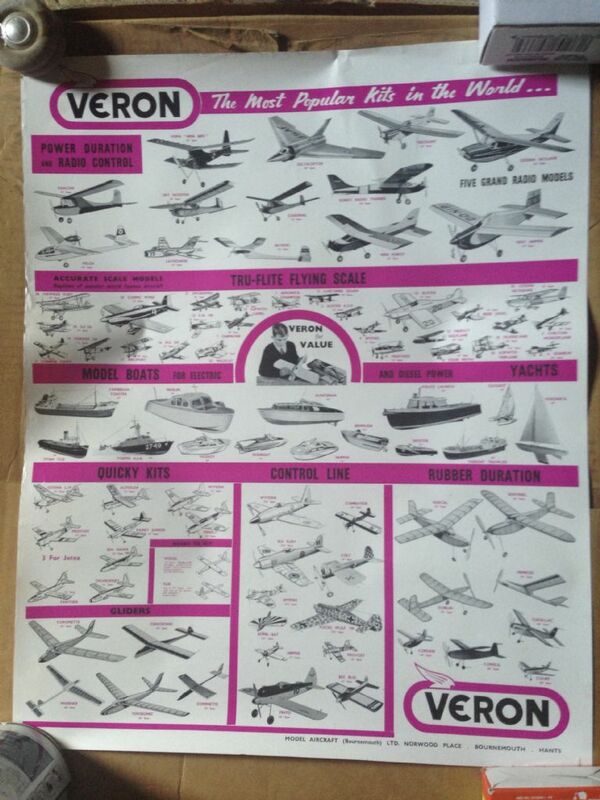 Here is a bit of Veron Model Aircraft History to stir our older members memories of either building some of these models or licking the model shop windows looking at the and saying one day when I'm earning enough money! This is about 60 years old, showing the ravages of time. Although the model was marketed as having a spindle moulded hull. 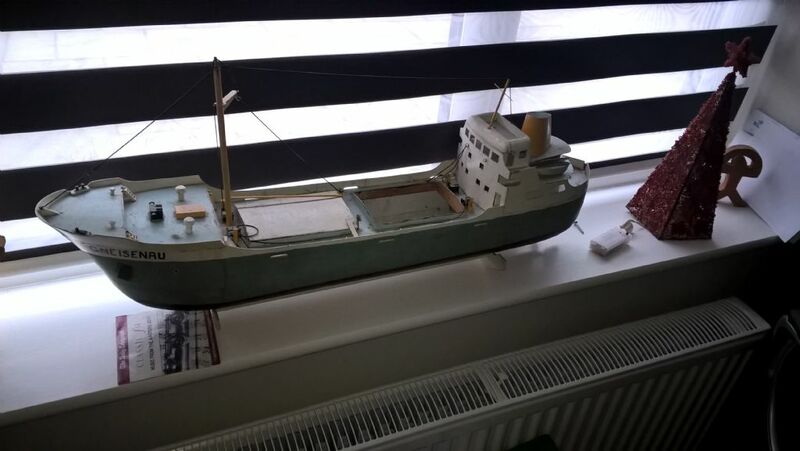 The reality was that it was made from blocks of balsa, some of which were pretty much rough cut, requiring an incredible amount of sanding for a 13 year old boy, with a sheet of sandpaper, and some rusty old metal files. In the end it was done. Probably the weakest bit is that the superstructure will have been balsa cemented together. The hull from something called Aero glue? A two pack adhesive, one a powder mixed with water, the other bit I think was probably acid based. I have a few of these posters and a few box tops as well. Must get around to getting rid of them! I don't recall Aero glue but have seen the name. It was Cascamite for me Again a powder and water. Good stuff. It was probably Aerolite glue which was also used in making the DH Mosquito, Airspeed Horsa and boat building. You have got it, KC, once you see it written down, then you remember. Over the years I have considered cutting it in half and then adding a section. Like Cammell Lairds have done on a number of full size ships to lengthen them. Mainly as the forecastle area seemed to big. Then I have thought of buying some ISO freight containers and stacking them as you now see, entering Liverpool. Putting modern cranes on. Anyway what would Phil Smith have thought. I must admit to showing my age but I do remember Cascamite. A white powder plus formic acid I believe. Stunk like hell and took all night to set. Those were the days. Cascmite is a casein based glue (made from milk) and is a powder mixed with water. No acid involved. Maybe you're thinking of Aerodux. Disagree. I never tried the stuff but a similarly aged 12 year old friend was trying to build a Junior 60 with it. I seem to remember that you mixed the powder with water to make a paste then added the acid as a catalyst. I stand to be corrected here. Can`t remember if I had breakfast today but-------. I am building one of them at this time,a Cardinal for radio assist. A mate & me made several household items as woodwork projects at a local school after we retired. The glue we used was Cascamite. The powder simply needs mixing with water in the correct ratio, it has a smell but not particularly strong or obnoxious. We usually prepared several sub assemblies that needed to be glued, mixed enough Cascamite for the lot, applied it where needed, clamped up the parts, wiped off any excess that oozed out of the joints. We then left it to dry overnight & we went to the pub to congratulate ourselves on an evening well spent. Although it's water based Cascamite is waterproof when set. I used it when builidng a Lesro Rapier model cabin cruiser & a couple of waterplanes. Apart from the slow the slow set time, the only real disadvantage for model making I've found with it is that it seems to have a shortish shelf life after the container has been opened. Most of the unused powder invariably hardens in the container within a few weeks even when care is taken to close the lid promptly after use. Here's the Cascamite tech data sheet pdf. As for Veron models I have a photo copied, illustrated list of vintage model plans that the late Phil Smith at one time supplied to order. When I've time I'll scan & post some of the 10 or 12 pages. Most are Phil's Veron designs but there's also a few others. 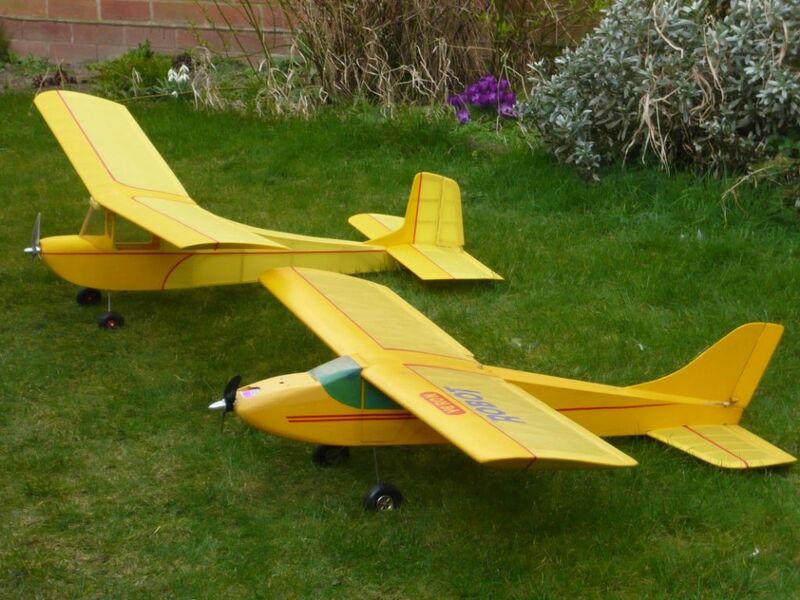 I've got a couple of Veron Deacon & Robot in flying condition, also the wings and tailplane of a Sky-Skooter that needs a new fuselage & an unstarted Tomtit kit. Now that is a well built and finished Deacon. The Deacon was my OK model in most respects. My Frog Minx had baggy tissue covering, with a good thick coat of yellow and black Humbrol. My Short Seamew, never got covered. A Keil Kraft Sopwith Camel was over weight, which ended up with a 3v motor in it, a tiny battery, crashing from the bedroom window into the yard below. However the Deacon, taught me how to burn your fingers, whilst attempting to steam the curved top stringers. That simplicity is good. That the silly eye dropper sized tank with an ED Hornet, perhaps made better sense that the CL tank, in a free flight model. Also the elastic bands actuating the tip up tail, work better, when the tail is fully tipped up. Rather than a descending model, whilst still in flight, at its top speed, with the engine still running minutes after being picked of the ground. I think the tissue came out better partially because I seem to remember the kit came with it. I think until then I had used tissue that came from one of the local shirt manufacturers that used it for packing. Coming buck free. I also learnt that the colour went on best very thinly. It ended its life, when a (then fashionable) pelmet my father had put up, took of the wing tip off, as it fell of one night, whilst it resided in state on top of my wardrobe. £1.971/2 and I'm not old. If you remember the '60s, which are a blur to me, you should remember certainly the half p and when crisps were 6d a bag. If you deny it I'll repeat the Screwfix joke. BTC ... gratuitously rude dept ... LS18 etc. As one of the OLDER forum members I reckon thats as cose to 2 squid as you can get.